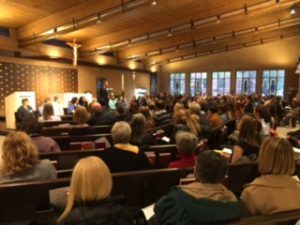 An effort to connect parish and community members with our neighbors in Chicago by praying victims of violence. We encourage you to pray for our neighbors and learn about initiatives that directly lead to change in violence and social justice in order to bring about peace to our own city. Pray for the victims of violence in Chicago, especially those who’ve lost their lives to violence in 2017. Pray for them by name, and pray for their families. We pray for each week’s victims during Mass in the Prayer of the Faithful and also include the names at Tuesday Eucharistic Adoration. Names are printed in the bulletin each week and available here online. You can also sign up to pray for a specific neighborhood in Chicago. See the #prayforpeace board in the gathering space. Pick a neighborhood, pray for those who live and work there. Take it one step further by visiting the neighborhood, support a local business, get to know our Chicago neighbors. Listen to those who are affected by violence and learn how you can plug into existing efforts to bring about peace in our city. Join us for an afternoon of inspiration, new connections, and a great boxing workout with The Bloc! Meet the kids and hear how The Bloc has set them up for successful lives before getting a glimpse of their passion– boxing– by participating in a beginner’s boxing workout. All ages and abilities are welcome, and you need no boxing experience to attend! Register at the link above, or contact Ellen Moiani at ellen.moiani@gmail.com for information on carpooling. 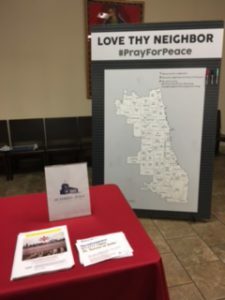 Meet up with other St. Teresa parishioners and see the good happening in Lawndale! Proceeds for this year’s race will benefit the Farm on Ogden, an innovative collaboration from Lawndale Christian Health Center and the Chicago Botanic Garden’s Windy City Harvest Program. The Farm is designed to be a food hub and urban agriculture training program that models a “whole person” approach to health and wellness. Your support and participation in this event will build a healthier community for those in need. Register, then email Rebecca O’Brien at robrien@stteresaparish.org to RSVP. 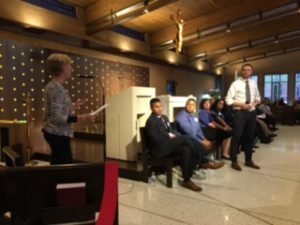 On Wednesday, May 3, 2017, St. Teresa’s hosted an event at which a keynote speaker and thirteen organizations who are working to fight gun violence in Chicago all presented their perspectives on what’s happening in our city. We are pleased to say that over 200 attended! Thank you to all our parishioners who joined us that night. We also want to say a specialthankyou to those who volunteered to help things run smoothly. Another great example of St. Teresa’s pulling together for a meaningful purpose! If you’re interested in learning more about the organizations that participated, click on their name to go directly to their website.